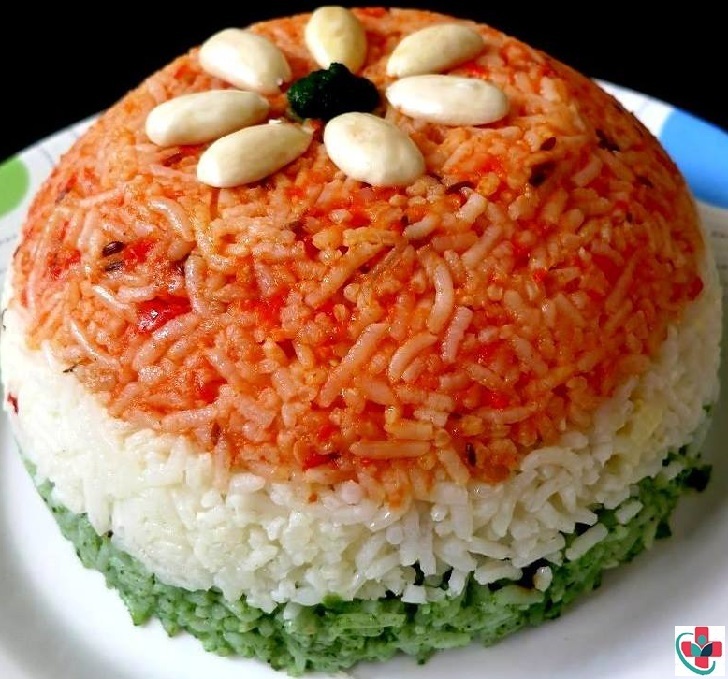 Tangy orange-colored rice with accents of tomatoes and carrots; fresh green-colored, coriander flavored rice interspersed with juicy green peas; and soothing white rice tinged are all assembled fantastically in an oven-safe bowl and baked till the aroma fills the whole house! Three-in-one rice is sure to bring everyone to the table even before you call them. Dhania powder – 3/4 tsp. Wash and soak the rice for 30 minutes. Boil 6 cups of water in a bowl adding whole garam masala and few drops of oil. Add the rice once the water boils. Add some salt and cook the rice in medium flame for 5-7 minutes till rice is ³/₄th done. Drain the excess water and remove the rice in a plate. Divide the rice into 3 portions and spread them in a plate. Wash and chop the spinach leaves roughly. Heat oil and saute the spinach leaves and green chilies till the leaves shrink in volume. Grind it with fennel seeds to a smooth paste. Heat the oil and saute cinnamon and clove. Add onions and saute until it turns transparent. Now add the ground spinach paste and salt. Mix well until the mixture becomes thick. Set aside. Wash and grind the tomatoes into paste. Heat the oil and splutter cumin seeds & whole garam masala. Add the onions and saute until transparent. Add the tomato puree and mix well until its raw smell goes off. Add some salt,red chili powder,turmeric powder and garam masala powder. Mix well to make a thick paste. Lastly add some water and let it boil before switching off the flame. Mix the green paste and red paste with the reserved rice and keep aside. Now take a microwave safe bowl. Spread the green rice in the bottom of bowl. Above that layer the white rice. Lastly spread the red rice. Garnish with some coriander plus mint leaves. Add a tbsp. of ghee over the rice. Close it with a lid and microwave the rice for 8-10 minutes. Rice would be done. Remove the bowl and & transfer it to a plate by turning the bowl upside down.